Vacation project. 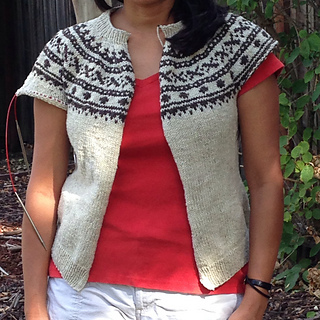 After lots of color work cardigan sweater searches, and deliberating I finally decided on this Brooklyn Tweed, Diana Walla pattern for the beautiful Clara Yarn CVM I ordered earlier this summer. 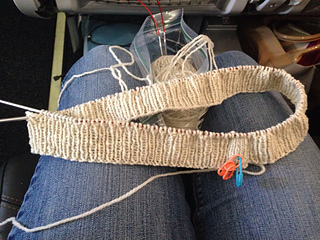 Will knit size 41” at smaller gauge to get 37”. 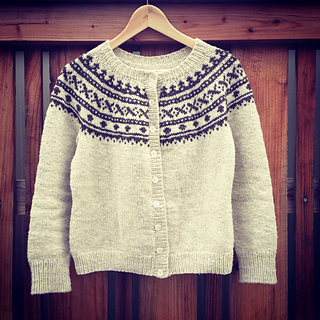 Add three steek stitches, make center front beginning of round, machine sewn reinforcement, cut open steek and add button band to make sweater a cardigan. Not sure if I will have enough of the white so I will cast on sleeve stitches provisionally when I reach the join round with the body, work color work chart, then work sleeves downward until I run out of yarn. 3/4 sleeves will be fine. Or maybe I will have enough yarn. 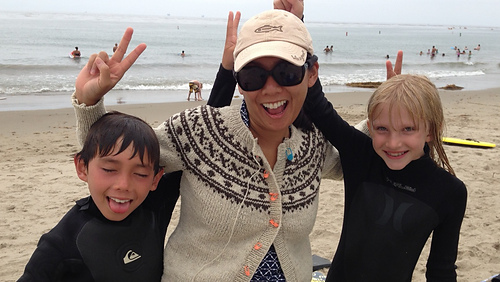 7/23 cast on in the car on the way to airport to beautiful Kauai for a family vacation. 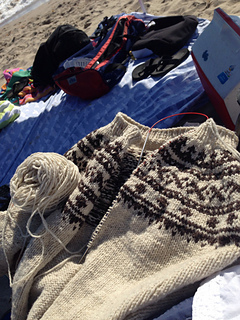 7/24-8/4 knit on the plane, in the car, at the beach, around the table during games each evening during vacation. Forgot to take progress pictures, but almost finished the color work section during our trip. 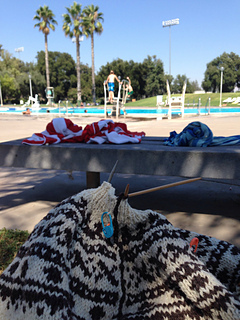 Loved having the easy stockinette in the round to work on all the time. Made lots of progress. 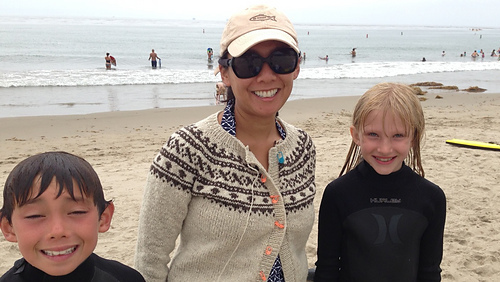 This sweater has lots of Kauai sand and salt water and rain water built into it. 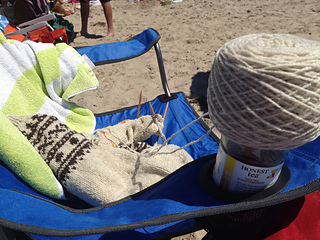 The light, woolen spun yarn made it easy to carry around and not at all hot to hold in my lap working on it. 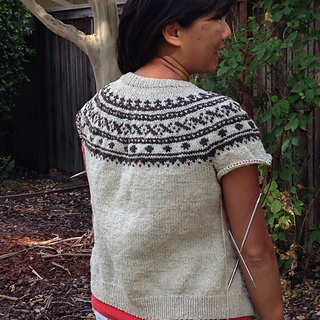 8/9 finished neck short rows, ribbing and bind off. 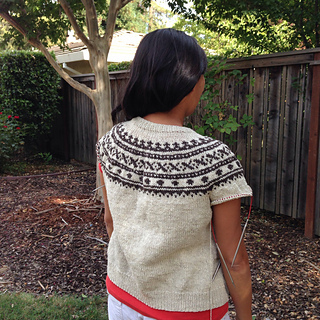 Machine sewed two lines of reinforcement along steek stitches and cut the sweater open. 8/10 got provisionally cast on sleeves and underarm held stitches onto needles and began working sleeves. 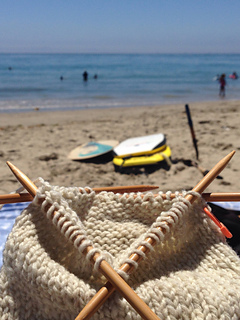 8/16 long drive to beach vacation = more sand, waves and lots of time to knit sleeves. 8/23 Sewed on buttons in all the wrong places on my first try- gahhhh. but took a deep breath, pulled them out and tried again and now they line up. Loved the two row button hole I used on this sweater, with passed slipped stitch closing up and sort of reinforcing the top of the buttonhole. I should have swatched the color work. My gauge was larger using US#8’s, than stockinette section on US #7’s. Blocking made it all fine, but next time, the way I knit color work, I should stick with same needle size for stockinette and color work. 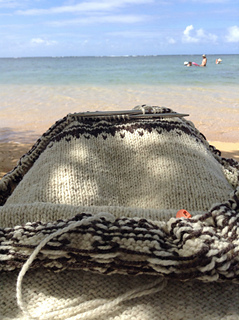 I used that trick posted by another raveler who knit this sweater where you turn the work inside out and let the floats run across the outside rather than inside. Worked great for keeping things nice and loose. Definitely do this again. Short rows at neck and collar on this turned out perfectly. I would delete the short rows below the color work section. Not necessary for my shape.